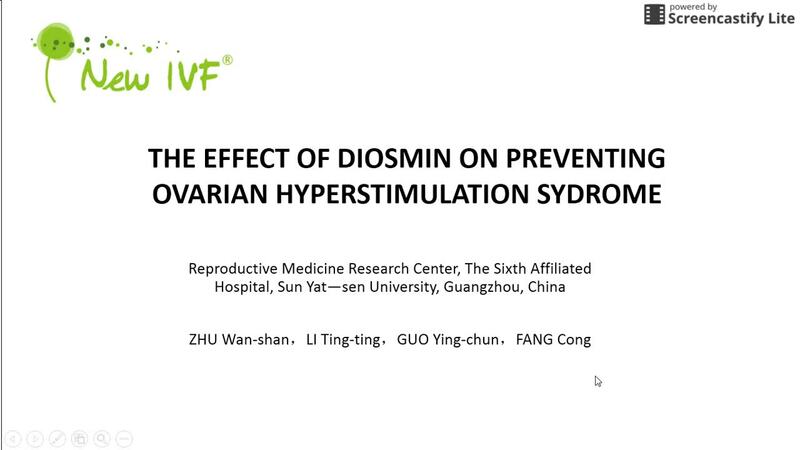 OBJECTIVE: To evaluate the effect of diosmin on the incidence and severity of OHSS (ovarian hyperstimulation syndrome) and to investigate the value of diosmin in prevention and treatment of OHSS. DESIGN: A randomized controlled clinical study. MATERIALS AND METHODS: Clinical data of 146 patients with high risk of OHSS after controlled ovarian hypersimulation in our center from September 2016 to December 2016 were analyzed. Patients were randomly divided into two groups. Tablet diosmin 1000mg was prescribed twice a day for a period of 10 days in the study group(n=74). The patients in the control group used the similar therapy without diosmin. The incidence and severity of OHSS in both groups were compared. RESULTS: There was no significant difference between two groups in age, body mass index(BMI), total dosage of gonadotropin and number of oocytes retrieved. The incidence of moderate to severe OHSS in the study group was significantly higher than the control group(6.16% vs 13.44%). Four patients in the control group needed paracentesis during therapy. There was no paracentesis performed and no severe OHSS occurred in the study group. CONCLUSIONS: Diosmin can effectively prevent OHSS and reduce the incidence and severity of moderate to severe OHSS.